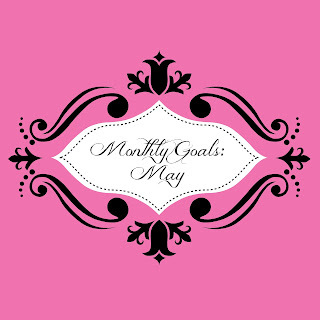 I'll be honest, I didn't really think much about my goals for the month. #sorrynotsorry I just had other things going on and was busy living life. Here's how I did. I kind of mentioned it above, but clear out and take apart the raised beds where the chameleon plant is coming through to kill it this summer. This is half done. We've gotten one of the beds mostly cleared out and will be working on the other one in May. Finish my 101 in 1001. Yeah...didn't even look at it this month. Go through my "box of crap" in the basement. I thought about it, but it didn't happen. Sort through and price stuff for the yard sale. Done! We got rid of SO MUCH STUFF. It was awesome. Plus we also made $200. 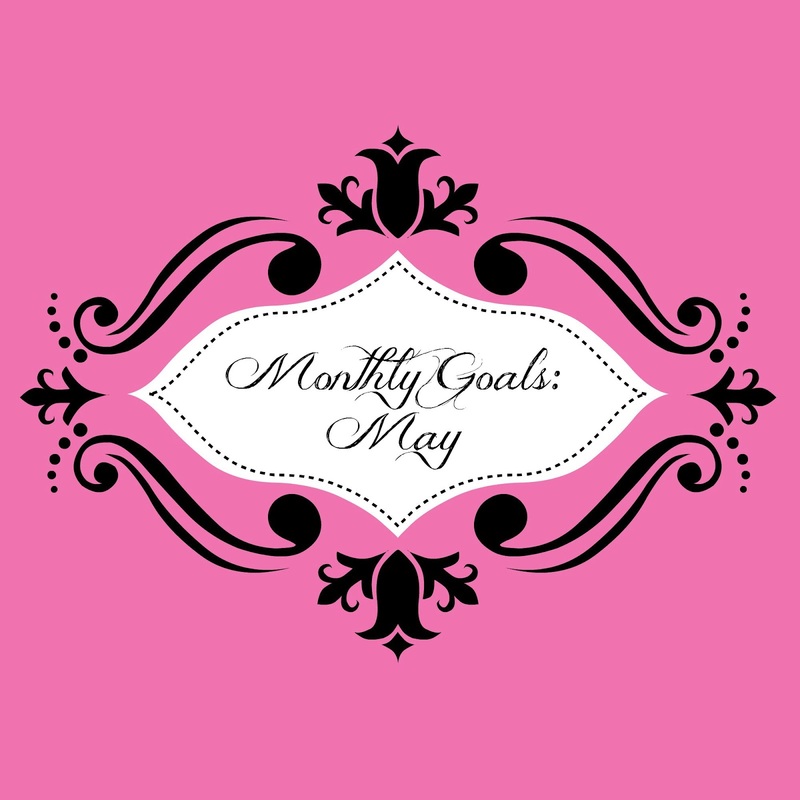 Here are my goals for May. Finish clearing out the raised beds. Finish my 101 in 1001. Actually go through my "box of crap." Run a great River Run race! I ran 10 miles this morning, in the rain. It was miserable, but I did it. I can't wait to run across the Ohio River in three weeks! Since I registered to run the half marathon during the Walt Disney World Marathon weekend, I figured I might as well get my rear in gear and finally write about our two days at Magic Kingdom. Unfortunately this isn't going to be as detailed as my other Disney recaps, but it's been four months since we were there and I've slept a little since then. Sorry! We had breakfast at the Crystal Palace with Winnie the Pooh and friends before the park opened so we could get in early and take photos without people in them, like the ones above. That was awesome because the two days we were there was insanely crowded and by the afternoon, it was almost impossible to get around because there were so many people there. 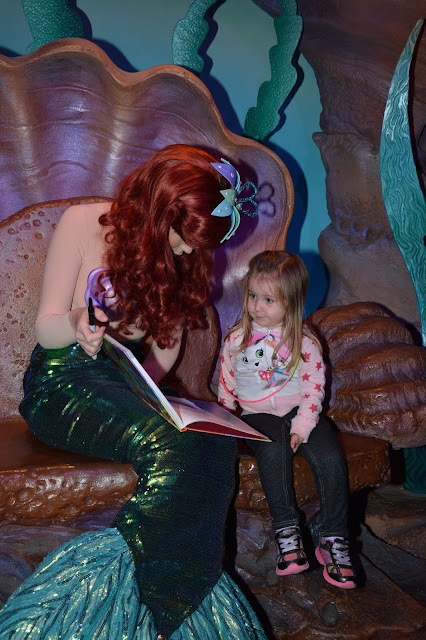 We were beginning to notice a theme with photos...Cecily didn't want her picture taken unless she got to give the characters our book to sign. So, Ewan and I took photos for her. Except for Mickey and Ariel. Those are her favorites. The rides we rode those days include It's a Small World, Astro Orbiter, Buzz Lightyear's Space Ranger Spin, Dumbo, Mad Tea Party, Magic Carpets of Aladdin, The Many Adventures of Winnie the Pooh, Pirates of the Caribbean, the Carousel, Seven Dwarfs Mine Train (Alan and Ewan), Tomorrowland Speedway, Tomorrowland People Mover (Cecily's favorite! ), Journey of the Little Mermaid (Cecily and I), the railroad and the Swiss Family Treehouse. 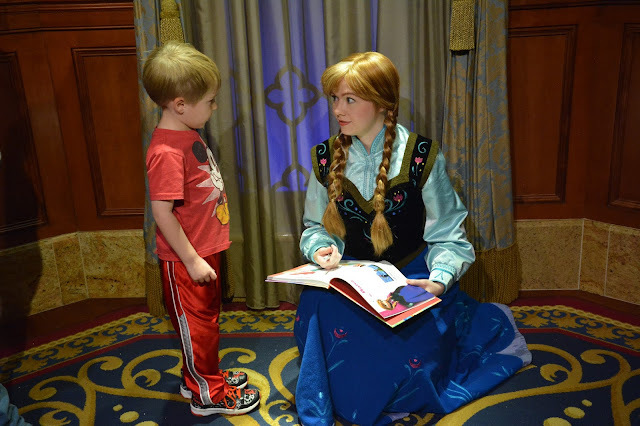 We also went to Belle's Enchanted Tales and saw Anna and Elsa. We had fast passes for Anna and Elsa, Belle's Enchanted Tales, Journey of the Little Mermaid, Tomorrowland Speedway, Seven Dwarfs Mine Train and Buzz Lightyear's Space Ranger Spin. Cecily and I rode the Little Mermaid ride while Alan and Ewan rode the mine train and since it was so early in the morning, we really didn't need fast passes for it. However, later in the day I saw that the wait was crazy long so you definitely needed them if you went later. We also made sure to see the parade one of the days and we also caught a show in front of the castle that we didn't know about. The characters we met were Anna and Elsa, Peter Pan, Merida, Ariel, Tinkerbell, Buzz Lightyear, Winnie the Pooh, Eyeore, Piglet, Tigger, Mickey, Minnie, Pluto and Goofy...I think. We were able to see Tinkerbell and Ariel without fast passes because we happened to walk by where Ariel was and there was only a 10 minute wait so we jumped on it. We saw Tinkerbell first thing the second morning so there wasn't much of a line. 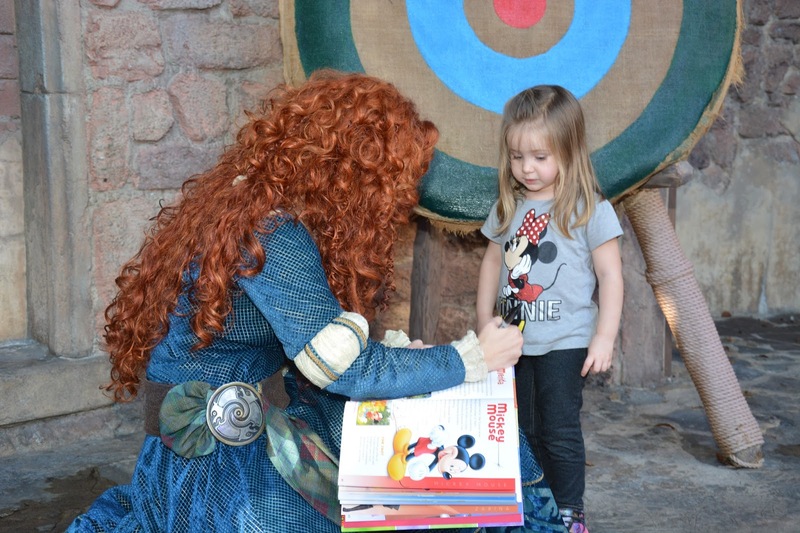 We also happened to catch Merida and Buzz without much of a line either. Peter Pan was a little ridiculous to meet. We had tried I think three times to see him before we were successful. And that was only because we just sat there in line for about an hour waiting while the kids were taking naps. 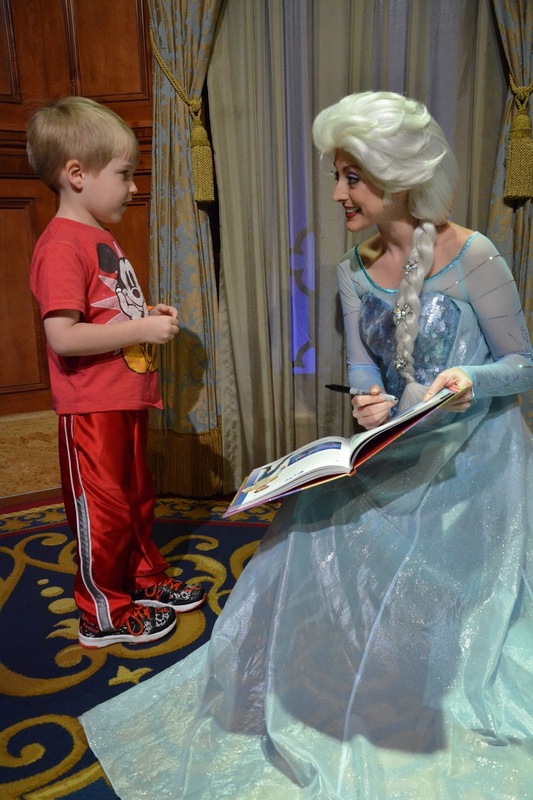 I felt so bad for them because Cecily was asleep when we saw Anna and Elsa and Ewan was asleep when we met Peter Pan. Our second day there was Ewan's birthday we went to Chef Mickey's for breakfast and had a super special treat for dinner, the Wishes Fireworks Dessert Party. Ewan didn't believe it that he was getting to eat dessert for dinner, but he loved it. We were up close and personal for the fireworks and it was an awesome show, even with the crazy lady next to us yelling at me because I accidentally bumped into her kid who ran right in front of me. Some people, I swear. Even though it was super crowded we had a great time during our two days there. The kids loved it and I'm sure will be bouncing off the walls when they find out we're going back next January! ...that I'm writing this post in the evening instead of in the morning. ...that a tornado touched down about 5-10 minutes from our house earlier this evening. Don't worry, we're ok! ...that I registered for the Disney World Half Marathon today. And I'm knocking out two of my running bucket list races less than a year from now. ...that while I know I will finish within the time limit, I'm kind of like "What did I just do?!" 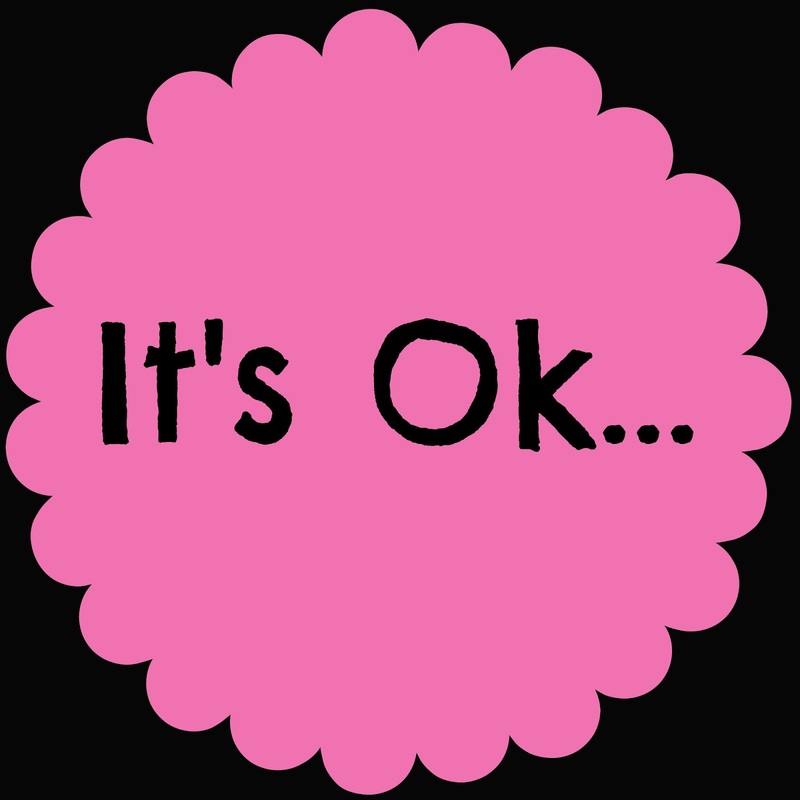 What's ok with you this week? ...that I have been invited to a bajillion Lularoe parties lately and I don't get what's so special about this brand. Although I won free leggings last night so I guess I'll be finding out! ...that I'm way more sore after a day of yard work than after running 9 miles. ...that I don't like dogs, but I want one to keep the squirrels and rabbits out of my yard and garden. With Mother’s Day fast approaching, sometimes we need a little help deciding on the perfect gift for our moms. The problem is that the usual gifts like chocolates and Mothers Day flowers, might be considered too old hat and ‘cheesy’. However, when it comes to giving your mother a gift on her special day, there is still a place for a beautiful bouquet of flowers and a box of her favorite chocolates. Along with these pretty safe gifts, you could always give your mom a fun gift as well on Mother’s Day. So with that in mind, here is a list of some cheesy or corny gifts you can give your mom this year for Mother’s Day. 1. Gourmet cheese baskets: We can’t start a cheesy list without talking about gourmet cheese baskets. If your mother loves cheese, then she will do a happy dance when one of these gift hampers arrives on her doorstep. 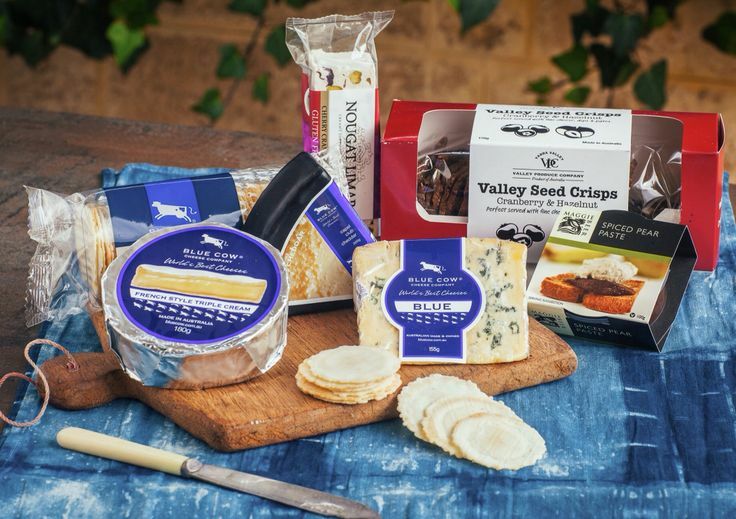 Check out the Blue Cow for a great selection of Australian cheeses. 2. Luxury baskets: There is nothing like a beautifully wrapped box of luxurious toiletries, lotions, fragrances and candles to make any mother’s heart beat faster. These luxury baskets might be an old idea, but they still make perfect Mother’s Day gifts. Check out the Glasshouse Montego Bay and Coconut Lime Retreat Gift Basket or the Marshmallow Flirtatious Florals Mother’s Day Basket – wrapped with love and posted with care. 3. A collection of quality teas: If your mother loves a cup of tea, then how about making up your own gift basket of luxury teas? Pop in a box of loose leaf tea from Taylors of Harrogate or Fortnum & Mason and your mom will be in tea heaven! 4. Plush bathrobes: Another oldie but goodie - luxurious bathrobes are always a great gift for Mother’s Day. Just imagine your mom wrapped up in a lovely plush bathrobe this winter, keeping her warm and toasty every day. Check out these luxury bathrobes from Designer in a Box. 5. Chocolates galore: Mother’s Day wouldn’t be complete without a box of luxury chocolates for mom. This might be an old gift idea, but there isn’t a mother in the world who would turn her nose up at a gift box of chocolates! The Chocolate Lovers hamper from Dellomano is a treat for any chocolate lover! Who said old wasn’t still awesome! Any mom would be more than happy to receive one of these cheesy gifts on Mother’s Day this year. It was all about Ewan last month, so this month it's Cecily's turn! Since she doesn't sleep, she answered these one night when she came back downstairs about 30 minutes after bedtime. What is your favorite thing to do with your friends? Who is your favorite person? When playing outside, what do your ideal sunny day plans look like? If you could plant a garden of anything, what would you plant? She then went on to tell me how there's no playing right now because it's bedtime and she's supposed to be in bed. This kid, I tell ya. ...that while I know where the Bye Felicia reference is from (the movie Friday), I don't get why it's all the sudden the thing to say. ...what the big deal about Star Wars: The Force Awakens is. We finally watched it this weekend and it's basically the same as the first movie (Episode IV), just updated for 2016. ...that everyone and their brother posting photos for National Siblings Day really got on my nerves. You don't see only children posting photos of themselves for National Only Children Day today. Oh wait...I totally did that. Turnabout. ...that even though you might think your pace is super slow, there's always someone out there in awe of you. A friend of mine told me recently that she couldn't believe I ran 9 miles at a sub-13 pace. She asked if I felt like I was flying. I was just out there, doing my thing, but her saying that really put that sentiment in perspective for me. Thank you! This post is sponsored by Karma Baker. 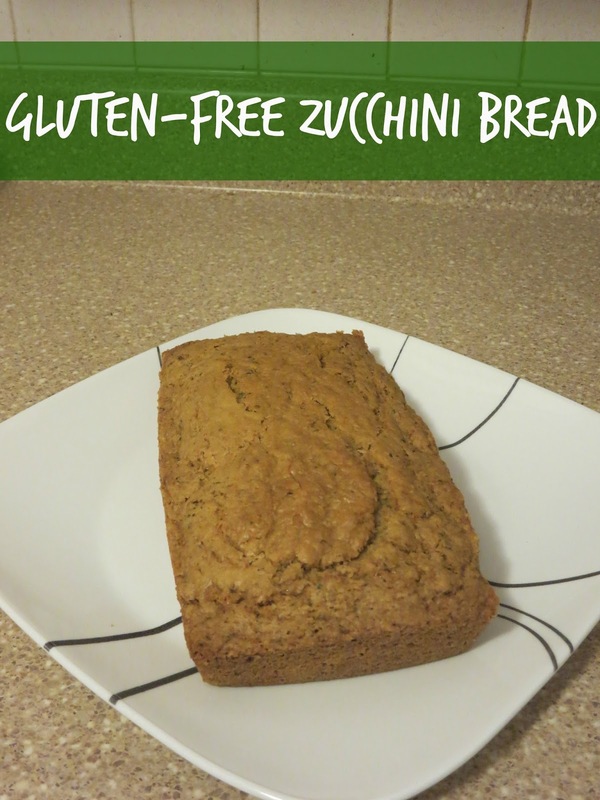 I was outside in the garden this weekend and it reminded me that I had some shredded zucchini in the freezer so I could make the kids' favorite, zucchini bread all year round. However I'm still trying to figure out what I've been reacting to recently, I'm not eating gluten currently. So, my usual recipe isn't going to cut it if I want to eat any. Luckily for me, I was recently able to try some goodies from Karma Baker that also included Celine's Organic Gluten-Free Baking Flour Mix. You can use the flour in any recipe so I decided to go for it with my zucchini bread and see what happens. Not only is it gluten free, but it's also vegan and doesn't use beans. I am able to eat eggs currently, but I decided to add a flax egg for some extra goodness and keep my bread vegan. 1/4 cup chocolate chips I always add chocolate chips but I was so excited to try my gf mix that I forgot to add them in! Preheat oven to 325 degrees. Combine dry ingredients and mix wet ingredients into dry mixture. Pour into greased loaf pan and bake 30-40 minutes or until toothpick comes out clean. In my oven, I bake for 20 minutes turn pan. Then bake for another 15 minutes. How was it you ask? Being gluten free, it's a little drier than normal, but the taste was right. My zucchini-hating husband gobbled it up. 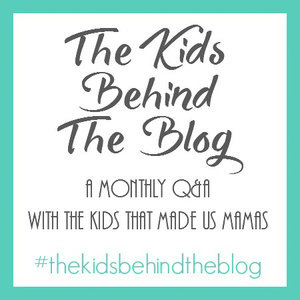 And my kids? Well, to quote Cecily, "That's good mom! That's good!" You can find more goodies from Karma Baker here. They ship nationwide too. I personally have my eye on some Karma Cakes. Check them out. You won't be sorry, I promise! Saturday morning I was back in Louisville to run the Healthcare Classic 5k with my friend Mary, with whom I ran the Anthem 5k back in February. The Anthem 5k was also in Louisville, but it was downtown, where it is flat. The Healthcare Classic was at Cherokee Park (designed by Frederick Law Olmsted - the guy who designed Central Park - for those of you who like random trivia), which is super hilly. The race started at the top of a giant hill and went downhill for almost the entire first mile (which we finished in 12:55 - way faster than Mary normally runs!). It was great for the beginning, but unfortunately that meant we had to go up the giant hill to finish. We chatted about life as we ran through the park, enjoying the spring morning. And going up and down hills. According to my Garmin we finished in 45:22, although I forgot to stop it as soon as we crossed the finish. We don't have our official times yet (they did manual timing! ), but it's probably more like 45:15. I feel bad because she wanted to a) be under 45 minutes again and b) beat our time from the Anthem 5k, which was 44:45. We were just shy of her goal. However, Alan brought up a good point. We were able to stay consistent to her normal times, even with the hill. That just goes to show how much she's improving! For me, it was a much needed hill workout. The beginning of the River Run is super hilly, so I definitely need to practice on hills!